Rated H-C60 Tilt model M6000 double hung, a thermally improved high performance window can be used in new construction or as a replacement window in houses, apartment buildings, schools and office buildings. Its advanced design virtually eliminates heat loss, sweating, noise infiltration and old fashioned cleaning methods. 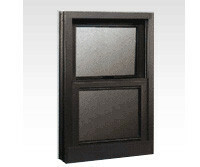 This is the window that gives you comfort and saves you money winter and summer. Insulating glass: 7/8 thick, warm edge insulated glass with dead air space. Vinyl marine wrap around glazing.